Movie star and guitar aficionado, Russell Crowe, is about to put a range of rare vintage guitars under the hammer. If you’re in Sydney and have decidedly deep pockets, you could get yourself something special. Need a rare vintage axe? Why not check out Russell Crowe’s collection of classics that is going up for auction at Sotheby’s. Among the collection that is coming up for sale are various Gretsch models, including a 6192 “Sunburst” from 1965, a limited edition Gibson Elvis Presley acoustic and a 60s Grammer “Johnny Cash” G50. By far the rarest, and perhaps most interesting item, would be the Martin 2-42 Parlour guitar, which dates back to circa 1870. This piece, that is of genuine historical significance, is expected to fetch between $50,000 and $100,000. The auction will take place on April 7 at Carriageworks in Sydney. 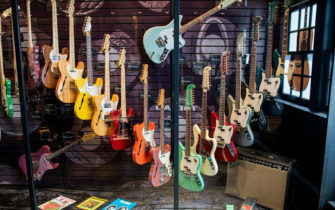 If you can’t actually afford to buy the guitars (fair enough), you can check them out at an exhibition showcasing some of the items at Carriageworks from 4-6 April. Visit the Sotheby’s website for more details and check out some of the guitars below.